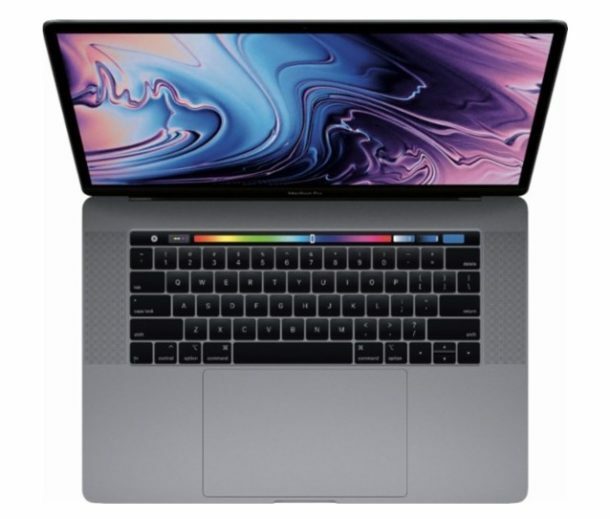 Apple has released a bug fix software update for macOS High Sierra 10.13.6 aimed specifically at Mac users who own the latest 2018 model year MacBook Pro with the Touch Bar. The update is labeled as “macOS High Sierra 10.13.6 Supplemental Update for MacBook Pro (2018)” and apparently aims to resolve a problem where the new MacBook Pro Touch Bar models were sometimes dramatically underperforming due to thermal issues with the processor, causing the CPU to throttle itself significantly. Installing the bug fix update should therefore resolve the performance issue. As always with any software update, be sure to backup the Mac before installing the patch. Owners of the impacted MacBook Pro (2018 model only) will find the supplemental update available to download now from the Mac App Store Updates tab. Optionally, eligible users can download the update directly from Apple at the link below. If you have a new 2018 model year MacBook Pro with Touch Bar (or are planning to buy one) then you’d certainly want to install this supplemental software update right away to that machine. Other Macs are not impacted by the bug, and therefore do not need the same software update. The software update appears to come in response to what multiple MacBook Pro 2018 users have discovered, where, when the computer is placed under heavy workloads requiring significant CPU activity, the processor speed would throttle down considerably, apparently to prevent overheating. In a YouTube video that gained some attention, one YouTube video blogger discovered they could only get the processor to perform at top speed if the computer was placed into a freezer. While this particular update is for macOS High Sierra, presumably whatever the fix is will be included in an upcoming updated version of macOS Mojave beta as well. I suspect the CPU is throttling because it’s too hot. That’s why it runs normal when it’s put into a refrigerator freezer. My guess is they over-Ive-designed the case to be way too thin without enough ports and without enough ventilation, and maybe without sufficient heatsinks or fans, and so it can’t cool itself. If a processor can not cool itself sufficiently, it throttles the speed as a protective mechanism. It makes you wonder, what exactly does this patch do? Does it run the fans more often? On a side note about this very expensive computer, while I am happy they finally released a MacBook Pro with 32 GB RAM options, there are still the dreadful gimmicky Touch Bar, the much maligned keyboard, and lack of USB and HDMI ports, all of which makes this a computer that is not designed for a true Pro user like myself, or my office. Combine all of that with overheating issues and it’s obvious this model is problematic in many ways. It appears to me that it is designed to look at, but not use in a real world demanding manner. I will pass on this generation of computers, again, hoping that Apple is listening to pro users and redoes the entire thing from the ground up with usable ports and a real keyboard and no Touch Bar. For now I hold onto my 2015 MacBook Pro for yet another year, which remains unequivocally the best laptop ever made for professionals. The touch bar is absolutely lovely. The problem is due to a voltage controller which overheats and cant supply enough power to processor. It’s NOT a processor cooling issue in this particular case. I don’t know how they fix it, I would like to see tests myself. I would totally enjoy buying new touchbar MacBook, it will make work in FCPX, Davinci, Affinity and terminal sooo much more efficient. I wish I could easily remap my current fn-buttons for different apps that easily. I want to like this set of MacBook Pro laptops but I can’t do it. The 2016/2017/2018 just is not going to cut it for people like myself. As an observer I have been following this closely, because I would like a Mac laptop with 32G RAM, but I have doubts on so many levels, and there is much to dislike about the hardware. It also appears performance is better but heat issues remain after the patch. There is a follow up video from Dave Lee which is the guy who raised this heat problem originally shows that performance improved after the patch a lot but compared to other Core i9 computers in PC world which have better thermal and heat management solutions by being larger with better cooling solutions so in comparison the MacBook Pro still underperforms, which to me suggests this is probably due to the overly compressed design and lack of sufficient ventilation and cooling. Now as an observer it looks to me like the squished MacBook “Pro” can not cool itself properly and so that is probably why it runs very hot and thus the performance is reduced below what you might expect from a better heat management system. That is my guess; the computer is just not well designed to stay cool, and that opinion appears to be validated by the CPU temperature and performance. The patch helps performance but the patch isn’t going to add cooling to a chassis that can not cool itself. Strangely some tests show Core i9 is not faster than Core i7, which I assume is also related to heat? How else would a faster processor not actually be faster? I do think this laptop looks beautiful physically but for many of the “Pro” crowd it is not practical: bad heat management, no ports, removing esc/function row, TouchToy Bar, a big price tag, put the package together it does not make sense. The Verge who are big Apple cheerleaders rate the laptop well but describe the laptop as one that you need to test yourself before buying because of issues, is that a good review? Here is The Verge quotation that caught my eye. The Verge goes further to call Touch Bar as “a solution in search of a problem” but I think that is generous, my opinion is that it is a toy that is not becoming of a workstation level computer. Is that what you want to spend your money on? A laptop you do not trust that has a solution looking for a problem? Also people hate the keyboard, let us not forget about that. Long time complaints about the keyboard because apparently it jams up often from dust particles. Dust particles make the keyboard not work? For my job I often work outdoors with laptop and dust is part of that equation but from the sounds of it people in offices discover the keyboard jamming too. You take all of this together and it makes you wonder who this was built for? Not the target audience. I think Apple needs to redesign the MacBook “Pro” from scratch, and it is maybe that simple. Scrap the Touch Bar and keyboard while they’re at it too. IO a differenza di questi commenti sono uno convinto della touch bar che dopo circa 1 anno di uso non potrei più farne a meno per il mio lavoro di musicista professionista la trovo semplicemente fantastica se non vi piace comperatevi un altro portatile il mio macbook pro 15 – 2018 con i 9 dopo la patch funziona benissimo e soddisfa le mie esigenze quindi come vedete ognuno di noi valuta le cose secondo le proprie necessità e non per il sentito dire o forse criticate semplicemente perché ha un costo troppo elevato?, apple ha da subito risolto il problema con un semplice aggiornamento software cosa volte di + . Well more bad news for the supposedly professional lineup. Now they are crashing a lot. Apple is really starting to feel like Microsoft in 1998. I hope they course correct before the professional user base decides to move to linux and Windows. @Francesco, I assume that is Italian but I have no idea what it says because I can’t speak or read the language, I assume that applies to most others too since this is English language text. It must be a nice update but remember to back up your MAC before installing the patch.